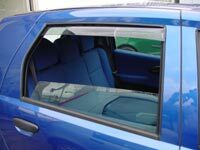 Rear window deflector for Alfa Romeo 155 4 door models up to 1996, Fiat Tempra 4 and 5 door models from 1990 onwards and Fiat Tipo 4 door models from 1998 onwards, sold as a pair. Special Order only. Delivery 10 to 15 days.